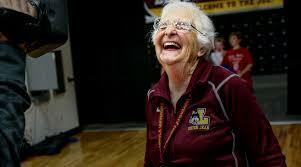 CHICAGO - Sister Jean Dolores Schmidt is the winner of Illinois' 2018 Senior Hall of Fame award. The Catholic nun and longtime chaplain of the Loyola-Chicago basketball team became a celebrity last March as the Ramblers reached the NCAA Final Four. In August she celebrated her 99th birthday. The Illinois Department of Aging says Schmidt will receive the award Friday for her "outstanding achievements in education." In a news release, the department says Schmidt is a fixture in the Loyola community and works to expand higher education opportunities to immigrant students. Schmidt won the hearts of many as she cheered the Ramblers during the NCAA tournament. The National Bobblehead Hall of Fame and Museum, in conjunction with Loyola University, even produced a limited edition Sister Jean bobblehead.